Over the last three weeks, with the help of Cédric Laurent’s excellent new book, I have looked at three superb Chinese handscroll paintings: The Nymph of the Luo River, The Second Ode to the Red Cliff, and Shanglin Park. Each is based on a famous Chinese literary work, and each shows strongly narrative painting. Here I’d like to draw some conclusions about the way in which those handscrolls tell their stories. The handscrolls are, as is traditional, designed to be viewed in short sections, starting from the right end of the scroll. They tell their stories in a series of separate scenes from that end of the scroll in chronological order, as the viewer works towards the left end of the scroll. Movement also occurs from right to left, and so is consistent with the passage of time as depicted. 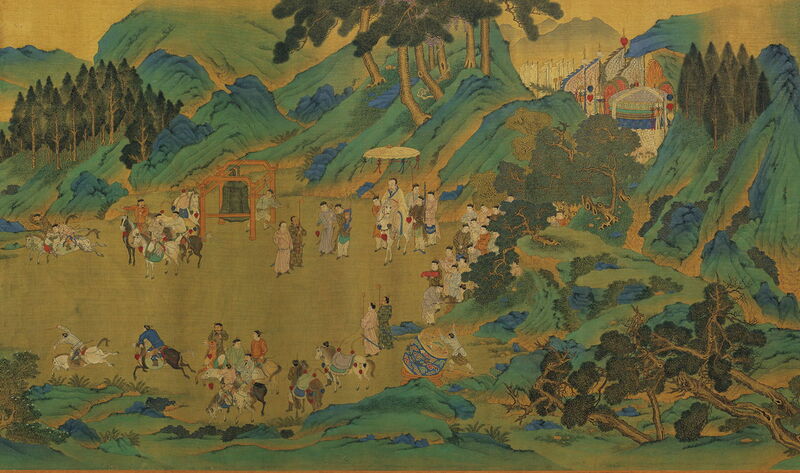 In the sixth scene of Shanglin Park, the emperor’s entourage appears from behind and to the right of the frame, and moves to the left, where members of the hunting party gallop off to the left. Although some scenes make visual references to previous scenes, there does not seem to be any requirement for the viewer to scroll back at any time. Each scene is painted as a narrative frame, much in the way that ‘comics’ (manga, graphic novels, BD) are constructed. Frames are not marked by an obvious visual device, but are usually separated by background non-narrative passages, such as water or vegetation. The most consistent marker of narrative intent is the repeated appearance in frames of visually identical figures, notably the main characters in the narrative. If you discover a handscroll painting in which visually similar figures appear repeatedly along its length, then it is reasonable to suspect that it is telling a narrative using serial frames. 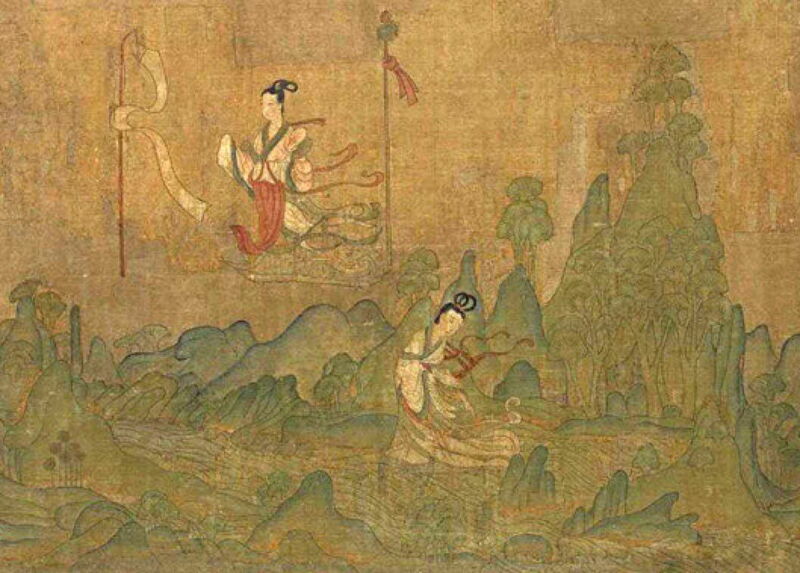 Although each of the three handscrolls shows the passage of a significant period, and two (Nymph of the Luo River and Second Ode to the Red Cliff) include nighttime, their artists do not provide obvious visual signs to mark the times of day or to suggest contrasting ambient light conditions. Most remarkably, and in contrast to modern comics and their relatives, identical locations are not represented as being visually identical. Wen Zhengming 文徵明 (1470-1559), Copy of Zhao Bosu’s Second Ode to the Red Cliff 仿趙伯驌後赤壁圖 (detail) (1548, original c 1132-1182), ink and colours on silk handscroll, 31.5 x 541.6 cm, National Palace Museum 國立故宮博物院, Taipei, Taiwan. Wikimedia Commons. In the Second Ode to the Red Cliff, the third (above) and last (below) scenes are set at Su Shi’s house, which appears quite different in the two frames. This avoids the handscroll becoming repetitive in its imagery, but assumes that the viewer’s knowledge of the verbal story will inform them that these are the same location. It is also worth noting that in the frame above, the scene is set at night; that below is after dawn. Not only do the handscrolls show multi-frame narrative like comics, but within frames figures can appear more than once. Gu Kaizhi 顾恺之 (copy after) (c 344-406), Nymph of the Luo River 洛神賦 (detail) (960-1279), ink and colours on silk handscroll, 27.1 x 572.8 cm, Palace Museum, Beijing, China. Wikimedia Commons. In the third scene of Nymph of the Luo River, the nymph appears twice: once to the right, down on the surface of the river, and a second time up above the river, and between two poles. Her appearance is identical, and there is no separation of these images along the length of the scroll. This is, therefore, multiplex narrative, in which a single image contains representations of two or more moments in time from a story. This was common in Western art until the end of the Renaissance. A more unusual feature is the visual echoing of sometimes quite elaborate objects and passages across scenes. The ninth scene of Nymph of the Luo River (above) shows the ‘carriage of the waves’, which takes the nymph away from Cao. It is echoed in the final scene by the appearance of the conventional carriage in which Cao travels back (below). Another interesting feature, which is shared by some comics and their relatives, is the use of purely descriptive scenes. The Ode on Shanglin Park contains long and lyrical descriptions of aspects of the park, which are depicted in non-narrative frames, such as this third scene. I hope that you have enjoyed looking through these exquisitely beautiful paintings, and that these small insights into visual narrative have been worthwhile too. If you know of any other non-Western narrative art which is amenable to such presentation and analysis, please let me know. explains different terminology used to describe narrative modes in visual art. Posted in General, Language, Life, Painting and tagged China, Chinese, handscroll, landscape, narrative, painting. Bookmark the permalink.